I've had this fabric in my stash for about 3-4 years. I picked it up at an independent fabric shop in Seattle called District Fabrics. It's a polyester crepe (my favorite fabric to sew with). It has a lovely pattern of birds perching on a branch and bright colors. I knew I wanted to make a simple design, I didn't want to get the bird print lost in too many design lines. 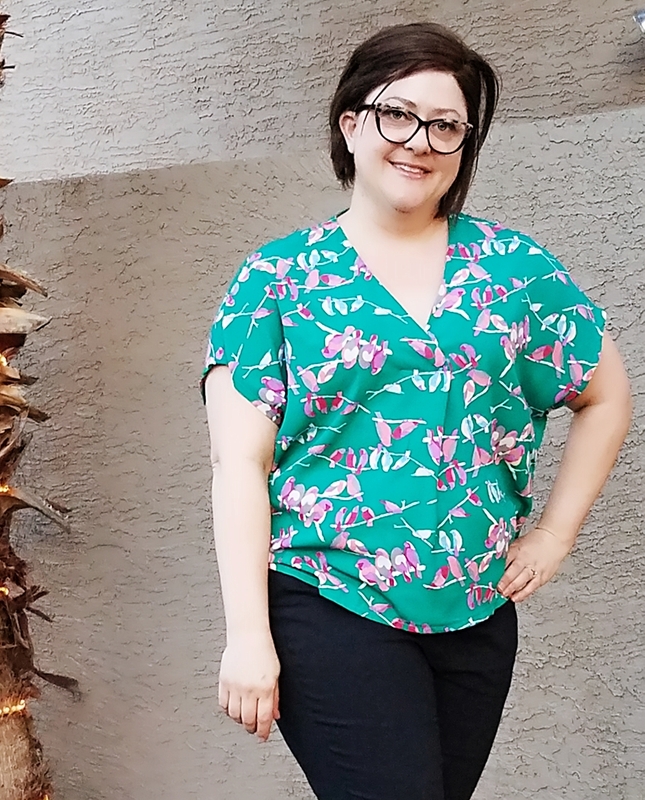 When Sew Over It launched the Cora Top, I knew this fabric would be a perfect match for it. I love the loose, breezy look of the Cora Top and pretty pleats. The Cora Top pdf was nicely laid out, pages matched together perfectly. 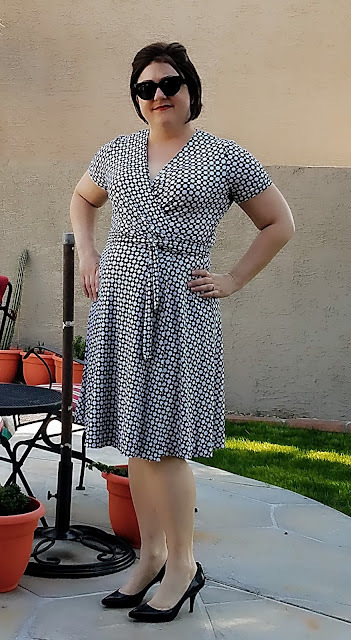 I cut a US size 16 based on my measurements. No alterations were made. The top was easy to sew up. The instructions are well illustrated. The most tedious part was creating the pleat in front, which is part of the v-neck. But it went smoothly following the directions. I'm really pleased with this top. I think it was the perfect pattern for my fabric. Also, I really like blouses like this that I can just throw on with a pair of slacks and head off the work in! I've been on a dress kick lately! 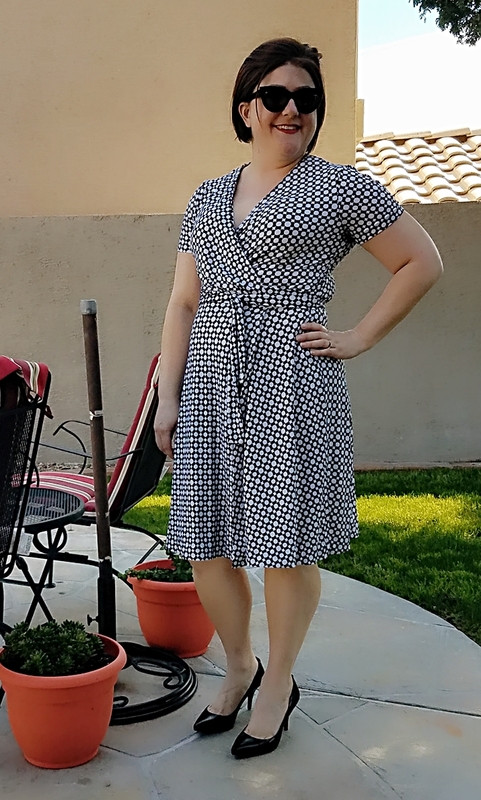 When I saw Butterick 6207, I immediately loved the lay back, cool vibe of the striped dress on the envelope. I used a french terry knit from Koshtex on Etsy. I love the heathered denim blue with white stripe. I cut the size 20 based off my measurements. Usually I size down but I wanted the extra ease in this. I kept the length as is. This sewed up quickly on the serger. I used my coverstitch for hems and topstitching. Not much to say about this one. It's quick and easy. And it feels like I'm wearing pajamas! You can never go wrong with a classic wrap dress! It's easy to wear and instantly makes you look put together. This is my third version using good old Vogue 8379. You can see my first version, one of my very first posts, here. And my second version here. The fabric is this great geometric black and white ITY knit I found on Etsy. I sewed the same size I did my first go around because my tissue is already cut. I am no longer the size I was 10 years ago but this is knit and honestly fits better now that I've put on some weight in different places. If I went by my current measurements, I'd be cutting 2 sizes larger today. This gives you an idea about the ease. I used clear elastic along the neckline to stabilize. 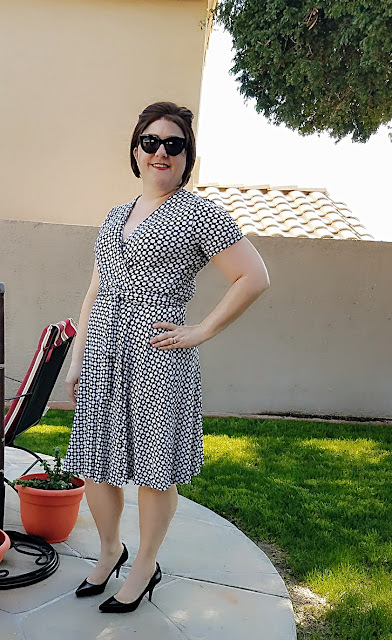 I interfaced along the front of the dress from the bodice to the hem. The pattern only calls for interfacing in the bodice but I recommend interfacing the self-facing of the skirt as well. I think that's about it as far as changes. I sewed this almost exclusively on my serger, only using the straight-stitch on the small details like the darts. I was able to get this done in a 4 hour sitting, not including cutting time. 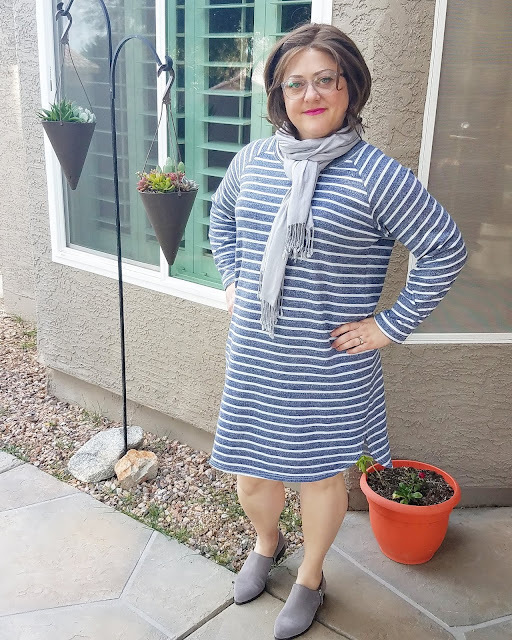 I just can't get enough of these dresses! I just love how easy to wear they are and how instantly stylish they look! I'm sure there will be more versions to come.